This is a supplement to an article that appeared in the March/April 2016 issue of Dimensions magazine. We asked science centers, museums, and aquariums to share how they are making their facilities and their practices more green and energy efficient, and how they have used these efforts to educate their visitors and communities about energy efficiency and sustainability. 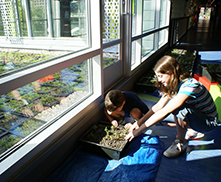 • Green roof: Boston Children’s Museum’s 23,000-square-foot (2,137-square-meter) expansion, completed in 2007, is covered with a 6,400-square-foot (595-square-meter) green roof of plantings and organic materials. The roof helps to improve insulation, collect stormwater, diminish heat islands, and reduce air pollution. • Stormwater reclamation and water-use reduction: We harvest stormwater from both the green roof and main roof of our original building (a 127-year-old former wool warehouse) for irrigation and dual flush toilets. The program helps to reduce water runoff into Fort Point Channel by 88% and potable water demand and use by the museum by 77%. • Glass addition: The addition includes full height windows that allow more natural light in, exterior walls that open for light and ventilation, new halide lighting to reduce energy consumption, and perforated metal panels that reduce heat gain. • Materials: When constructing our addition, we chose recycled and rapidly renewable materials as well as materials with low volatile organic compounds (VOCs), which improve air quality because they are less susceptible to off-gassing into the air. The museum also obtained 55% of the materials from locations within 500 miles (805 kilometers) of Boston. • Real-time heating and cooling controls: Boston Children’s Museum has installed carbon dioxide measuring tools into the heating and cooling systems in both the original building and the addition to meet real-time occupancy needs. • Efficient lighting and features: The museum has replaced its ambient light fixtures in the addition with highly efficient fixtures that reduce energy consumption. • Green cleaning/housekeeping: We have also developed a list of approved cleaning products and trained housekeeping staff on the proper way to store, use, and dispose of chemicals, paper products, and other materials. We have installed the Green Trail, which is a series of stations, each explaining a different component of the green building (low flow toilets, efficient light bulbs, etc.) We also have signage at the Green Roof that explains its function. In addition, we have a webpage that provides information about our green building. Technopolis, the Flemish Science Centre, in Mechelen, Belgium, has managed to obtain the international Green Key label for the sixth year in a row. Conscious about the need for a sustainable society, Technopolis has critically examined its ecological footprint and has implemented appropriate measures to reduce it through the years. Furthermore, by embedding the theme of sustainability in various projects, Technopolis endeavors to make as many people as possible (including its own staff) aware of their ecological footprint. We have taken many steps to make our 134,549-square-foot (12,500-sqaure-meter) building more sustainable including, among other things, a sensible waste management policy, the purchase of renewable energy, the use of motion-sensing lights and faucets, the use of LED lights, the practice of switching off exhibits and appliances when not in use, and the installation of solar panels on the rooftop of the exhibition area. The energy produced by those panels is displayed to the visitors. Sustainability is a theme that pops up in many interactive exhibits at Technopolis. For example, in the Xplora exhibition, which targets 8- to 14-year-olds, visitors can learn about a career as a climatologist, answer questions that compel them to reflect on how their daily habits have an impact on their ecological footprint, and choose the best option (such as solar or wind power) to supply energy to an entire city. Visitors wear RFID bracelets that allow all of their results to be gathered on a personal website. After they return home, they can consult their results, reflect on them, and share them with their friends to get them inspired as well. Additionally, the science center has developed scientific shows and workshops that specifically deal with climate change and recycling. These are also recurrent themes in children’s lectures. And as coordinator of the European project Climate Literacy, Technopolis shows its resolve to contribute to a more sustainable society. The Museum of Science, Boston, sits atop a dam along the Charles River. The institution stretches across the aptly named Science Park, a plot of land that borders the cities of Boston and Cambridge. Since 1951, the museum has added new wings and facilities that now encompass around eight different buildings, all connected together, at a total of 772,134 square feet (71,733 square meters). • Replacing an aging air conditioning chiller and old motors in our ventilation system with efficient, energy-saving equipment. We have a rooftop wind turbine lab designed to demonstrate several different turbines and help the community make informed decisions about urban renewable energy and policy. Photovoltaic panels on our roof also generate energy and balance much of the electricity consumed by the 2.5 million-volt Van de Graaff generator used in our lightning shows. To communicate and share our efforts with our visitors, we are creating a wall-sized illustrated mural of the museum in our entry concourse. Cut-away areas will show key building features and sustainability measures that reduce our environmental impact. Our goal is to inspire our visitors to think about actions they can take in their own lives. The Milton J. Rubenstein Museum of Science & Technology (the MOST) in Syracuse, New York, has been buying only green energy for several years, from Blue Rock Energy. And as part of its new energy exhibition, National Grid Energy: Powering Our Future, which opened in December 2015, the MOST is planning to install a 20-kilowatt solar power system on the museum’s roof. The system is expected to encompass 80 solar panels, which would provide enough energy for about 20 individual homes. However, the MOST measures nearly 35,000 square feet (3,252 square meters), so Peter Plumley, the MOST’s exhibits project manager, estimates the panels will provide only about 5% of our energy usage.